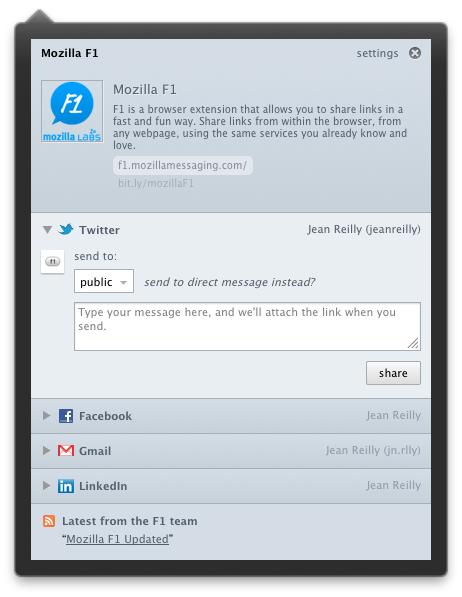 Mozilla F1 extension is a product of Mozilla Labs which is behind such incredible concepts like Seabird Mobile Phone. F1 is a simple Firefox browser extension that allows you to share links fast and easy. Share links from within the browser, from any webpage, using the same services you already know and love. 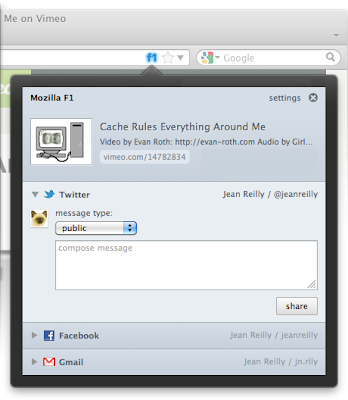 Mozilla F1 is made by Mozilla Messaging. Share your favorite links fast and easy using F1 Firefox extension. Support for Facebook, Twitter, Gmail, Google Apps, Yahoo Mail and LinkedIn. Firefox 3.6 is no longer supported and you have to have the latest Firefox 4 to install Mozilla F1 extension. Firefox 3.6 is no longer supported and you need to have the just released Firefox 4 to run F1 extension. Follow the instructions here to install latest Firefox 4 in Ubuntu. After installing the extension, hit F1 key to activate Mozilla F1 extension in your Firefox 4. Meanwhile, check out this very nice collection of Firefox add ons to make your browsing safe and secure once again.